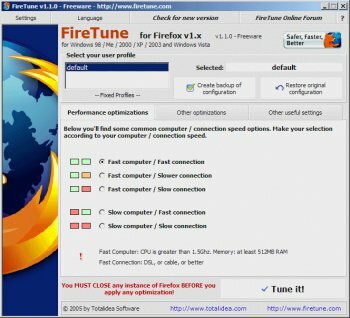 FireTune for Mozilla Firefox was developed for an easy and fast optimization of your browsing experience with Firefox. Usually you have to optimize Firefox manually, which can be time consuming and difficult for the novice user. FireTune helps you here - it includes all the performance optimizations. The only thing you must do is: make your selection. It does the work for you. Given that the prog heavily prompts for a backup to be taken and includes a restore facility the last, negative, review claiming all settings to bhe lost due to Firetune seems to be rather obvious junk...to put it kindly. Firetune works well and is well thought through...it's also entirely safe if you do the backup it so heavily prompts you to do and makes it so easy for you to do...all it takes is one click. I've used it for some time and never found a need to restore from backup to fix a Firetune caused issue. Wow. I don't what is up, but this completely wiped all my settings, bookmarks, everything! Thankfully restoring the backup worked perfectly, hence the notch up. Apparently you know very little about Firefox 2.0.0.4. To make such a blind statement. Millions are not wrong. Safe, Updated frequently so it's secure, extensions so you can customize it to your liking, not bloated and it goes on and on and not to mention the Mcafee Siteadvisor extension *Siteadvisor.oom). IE 7 is also based on Firefox for its security. Firefox is a top of the line browser along with Opera 9.2. Well, On slower systems this does a great job at speeding things up.On faster systems, It tweaks it a bit but it won't be needed unless you download loads of extensions.. Otherwise, For someone like me who uses loads of extensions... i can tell the difference ..
5/5 for doing what it claims and doing it well. Again, I will reiterate as crosscut below me did, that if mozilla took the time to optimize its code, apps like this wouldnt be necessary and firefox would be a lot better, imho anyways. Now, go ahead and flame away sophist, do what you do best. As flaming is what you seem to do best. I agree with Metshrine. While firefox is an ok browser, not the best, but ok, it is plaqued with unoptimized code that leads to high resource usage and slowdown. Firetune is good, it does its job, it does it well, however, I think that the need for applications of this sort would be eliminated if they simply optimized the code in firefox and fixed some of the LONG STANDING bugs that have existed for years (since .1). So sophist, how about you take the time to NOT flame others in your "reviews" as I've seen you do in almost every other one of your posts or "review" on this site (since you want to point fingers here). Not necessary according to my experience. FF 1.5 works well, FF 2.0 better still. Again, a browser that requires a tweaker to be able to run at any sort of decent speed isnt a good browser in my opinion. 5/5 for an app that does what it says, but shouldnt be required. By the way, why dont you try not flaming against others in your reviews and focus on the app at hand ;-) That is the point of a review, not to bad mouth others. So again, dont be hypocritical if you want to call someone a troll. I will wait for Fasterfox to make itself compatible with Firefox 2.0. Although I must say 2.0 loads pages much faster than predecessors without optimization programs like I needed with previous versions. I did not like FireTune previously. I do not expect it to be better now. @Metshrine, Firetune tunes (it does!) mainly on a per-system basis. Otherwise, everything which is proposed by Firetune may be done "manually" by editing either the options, either the about:config data, either the user.js file. For beginners it's handy, that's all. So, you're telling me, that in order to get firefox to use even slightly lesser ram than its already bloated core uses, and to get it to respond 1/4 a second faster, I have to use a 3rd party program? Why not just have mozilla fix it? pffft, waste of time if you ask me. Any browser that requires a TUNING or SPEED UP program, obviously isnt worth my time. Nice app, worked flawlessly on my firefox. FasterFox is a nice extension but it does currently have some issues with the latest Firefox v1.5.0.6, but I'm sure an update will fix that soon. If you want a fast browser, just get Opera, is still 3x faster than Firefox, even after naff apps like this mess around with internal settings. It's a small extension, includes a page load timer, prefetching... bunch of other stuff, check it out. Any browser that requires a seperate piece of software to make it function at a reasonable speed is not a well written browser in my eyes. 5/5 for doing what should have been done in firefox from the start.